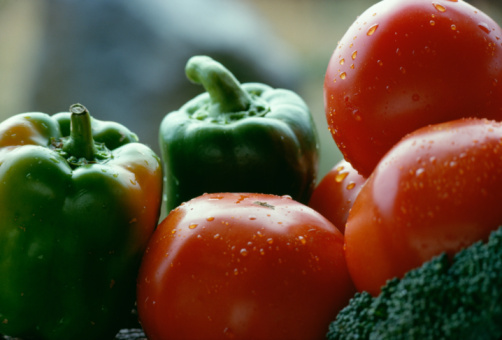 Grow fresh vegetables all year in Phoenix. The hot summer sun is a good thing for the right vegetables. Thoughtful garden design protects plants from too much sun. Irrigation and shade are key ingredients to enjoying the fruits and vegetables of your labor through summer's heat. Peppers and tomatoes thrive throughout the Phoenix summer. Irrigating vegetables is a balance of the right amount of water at the right time of day. Thorough watering early in the day provides a reservoir from which plants can draw through the heat of the day. Drip or soaker irrigation is preferred, because water droplets on vegetables or leaves turn into magnifying glasses concentrating sunlight and burning the plant. Overnight watering contributes to molds and soil-transmitted disease. Missing one day's irrigation can kill plants in the summer. Peppers, corn, most tomatoes and melons thrive in the heat and sun all day long. Most herbs, basil is an exception, need shade from direct sunlight. Other vegetable plants, such as leeks and eggplant, also need protection from direct afternoon sun. Shade cloths, readily available in the Phoenix area, are easily installed over sensitive plants. Protect plants from violent summer monsoons and their wind, hail and heavy rain by using poles, stakes or tomato cages to keep plants from breaking during the pummeling. Ensure shade cloth is well anchored and has wind flaps to reduce the chance of it sailing away in the storm. Dust on leaves interferes with transpiration. Gently wash dust off leaves with a light spray late in the afternoon or early in the evening. Carefully apply water to leaves and avoid saturating below the soil surface. Mulch benefits the Phoenix vegetable garden by helping retain water and preventing weeds. Chunky mulch, such as a bark, allows airflow at ground level, depressing soil temperature and protecting roots. Direct sun turns containers into ovens, baking vegetable roots. Any plant in a container needs to be shaded, beginning at midmorning. Irrigate containers twice a day to maintain a cool soil temperature. Potted soil is less susceptible to disease allowing for the twice-a-day watering.